Pop Culture Confessional is a weekly column where our writers can divulge and indulge in their most profoundly obstructing cultural passion — and then tell you why it really rocks. everybody has a few dirty little mysteries. Only the truth shall set us free. Yes, I am a fan. A big one in fact. So big that I stood next to the stage at their World Tour stop in Chicago this summer. My altogether normal, straight compulsion with the JoBros — or more dearly, the BroJ’s — kindled its fire around the first time I heard “S.O.S.” on the radio. It was, and still is, infective to the core. I challenge those pious haters who pout at the first utterance of the Jonas Brothers to listen to just one minute of this song. It’s nearly unacceptable not to be sucked in. That being said, I am aware that my level of fandom exceeds normal levels. And I don’t know why. As hormonal tweens texted into the concert screen phrases like, “SCREAM IF U LUV NICK” and “SCREAM IF U LUV JONERS,” Allstate Arena burst into shrieks of epic proportions. Just as the hair follicles in my inner ear were shattering, I understood I was trampling water in a sea of 20,000 horny tweens. I won’t lie — it was unusual to think that as I was preparing for college, the majority of the stadium was preparing for junior high — or third grade. For the first time in my life, a less than average 5’4” was an wholly passable height for looking out the concert. In front of me, a tramp-stamped mom held up her kid to grab Kevin’s crotch. Behind me, a 12-year-old let out a shriek that reminded me of Janet Leigh in Psycho. And there I was, with my two friends, 18 years old and just as crazy. I knew this was weird. But I don’t care. Because they are awesome. Maybe the Jonai are truly a God-fearing, purity ring-swearing, Louis Vuitton-wearing boy band. Or maybe they are smart businessmen capitalizing on their image and the raging hormones of pubescent girls. And me. The recently engaged Kevin told Rolling Stone in June, “We have an operation around us that we run.” That kind of rhetoric makes one question the genuineness of their image. Maybe they are just riding this wave of preteen obsession and milking it for all it’s worth because the truth is, the band has done little to pull a different demographic. This could be viewed as complacency, or a smart business move. Or it could be true prowess. It’s possible that all the music orchestrated by the multi-talented Nick, or Mr. President as his brothers call him, is in fact the true craft of a musical family. The band has been writing since 2005, with each album arising in musical and lyrical complexity. I am not saying they are Sondheim, but JB has certainly matured artistically. The fact that they are unconcerned with who their audience is could be interpreted as a true love for their music, no matter who listens. But that is rather high-minded. Over the head of the kid being held up in front of me, I grabbed a glimpse of a silver band on each of the boys’ ring fingers — undoubtedly the famed purity ring. In interviews, in which the Jonai are necessarily asked about them, it is hard to notice any artful tone in their voices. After all, their father is an evangelical minister. So isn’t it equally possible that Nick, Joe and Kevin are in fact the wonderful role models thousands of parents expect them to be? Isn’t it possible that the boys are 100 percent authentic in their image and are simply caught up in the game of pubescent mania. Nick is only 16 and, after dipping his hand in the Disney pot, could be looking for love out in one of those arenas. When Joe, in concert, grabs a mega-SuperSoaker and shoots foam out over the faces of feverish girls, how do you spin that? A nuanced performance tacked with subliminal messaging? Or simply an interactive performance that is fun and not too messy? 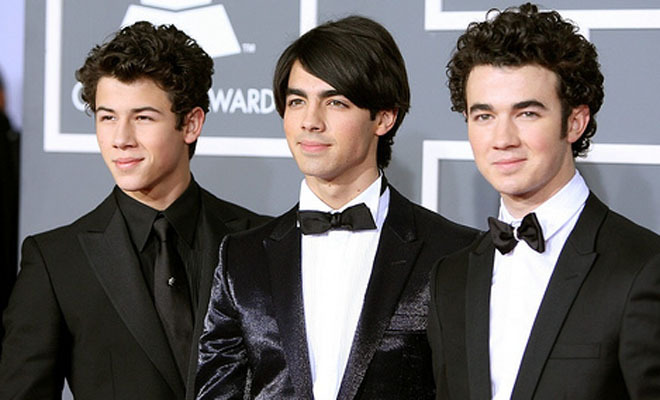 I can’t doubt that the Jonas clan knew the implications of their performance — they are teenage boys after all. But what does it all really mean? I may just have to ask Nick when he starts actually attending Northwestern (I’m already freaking out). The truth is, however, I don’t care if they’re real or fake. I’m mildly obsessed with them, and proud of it. Excuse me while I squeal with the rest of the preteens.